Dr. Oliver Sacks (1933-2015) was a British neurologist and author who studied and wrote about disorders of the brain. One of his accounts, The Man Who Mistook His Wife For A Hat, was published in 1983 in the London Review of Books. The story concerns one of Dr. Sacks' patients, whom he referred to as Dr. P to retain anonymity. Dr. P was a singer and a music professor at a local university. He had recently developed diabetes but was otherwise in good health and had normal vision acuity. However, Dr. P could not discern or comprehend certain objects or recognize people’s faces. He had lost the ability to understand what his eyes were seeing, and could only comprehend the world through abstractions and secondary characteristics, such as shapes, sounds or movements. While preparing to leave the room after the examination, Dr. P mistakenly grabbed his wife’s head instead of his hat, thus providing the title for the account. Dr. Sack’s diagnosis was that the problem was not in the eyes, but in the brain, and that Dr. P suffered from a general disorder known as visual agnosia, the inability to recognize previously familiar objects, and a more specific illness called prosopagnosia, the inability to recognize familiar faces. Although the cause was never disclosed, it was believed that the disorder was a precursor to Alzheimer's Disease or possibly caused by a brain tumor. Despite these handicaps, Dr. P’s musical skills and talents were unaffected. Music became his way to maintain focus, continuity of thought, and a degree of normality. Humming and singing continually throughout the day became his coping mechanisms, and allowed him to continue living an otherwise normal life. This story became a one-act chamber opera, with music composed by Michael Nyman and libretto written by Christopher Rawlence, Michael Morris and Oliver Sacks. It was first performed in London in 1986. 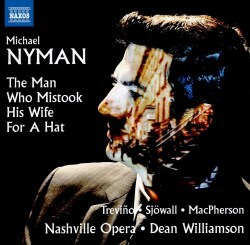 The present disc features a performance by the Nashville Opera Orchestra, led by musical director Dean Williamson and stage director John Hoomes. The libretto takes the form of an introduction by the narrator and a three-way conversation between Dr. P, his wife Mrs. P, and the Neurologist, who doubles as the narrator. The conversation is Dr. P’s initial examination by the Neurologist with his wife present. Other scenes present further analysis, discussions and conclusions. The music is sparse and tense, with the Orchestra’s stringed instruments playing jagged rhythms and the piano primarily providing support. The performance reflects the tension and anxiety of Dr. P’s medical condition and his experiences trying to decipher the messages that his eyes were sending to his brain. The singers are seasoned opera performers; bass Matthew Trevino as Dr. P, soprano Rebecca Sjowall as his wife, and tenor Ryan MacPherson as the Neurologist. The story holds the attention, and the recording is entertaining. However, it is an opera that should be seen as well as heard for best effect. Much of the dialogue is difficult to follow or comprehend without reading the libretto. This can be found here. A succinct synopsis is set out in the liner-note. As far as I can see the only other recording is the original (CBS Masterworks MK44669) which was issued in 1987 in a version conducted by the composer. I should just mention the well regarded original cast which comprised Emile Belcourt as Dr. S., Frederick Westcott as Dr. P and Sarah Leonard as Mrs. P.
While the original can still be had in used copies via Amazon this Naxos disc is a valuable and satisfying addition to the catalogue restoring this celebrated Nyman opera to general availability.